The Academic work team that visited Response Network spared some hours to spend with some of the girls that are under their support after a field visit to some community schools that they have supported. The team interacted with a group of 130 girls from different schools at Livingstone royal golf club. 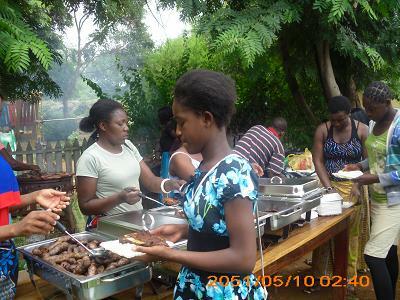 Others could think of it as just an ordinary event but for the girls it was something extra ordinary. Some girls arrived at the venue as early 10am when the barbeque was scheduled at 1pm. Some have never attended such an event, and it was a life time event that they will always hold in their hearts and never forget. While the girls were waiting for the team to arrive, some could not keep away from the water. Upon seeing the team arrive, the girls shouted out loud and one could tell that the girls were so joyful to meet the people that are making them attain their education and have the looks of a decent girl in school by providing them with all school needs. They sang and clapped as they welcomed the team. After the introductions they were quickly divided into group, with each group being guided by 2 team members. They chatted and expressed their happiness, others had sad stories to tell but all in all they had a chance to talk to someone.The food was served and just after having their meal they painted some post cards. 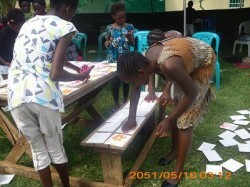 The girls having their palm print on a post card; this installed a feeling of recognition in them. They actually felt like the Fredrik Reinfeldt and Carl XVI Gustaf of this world. 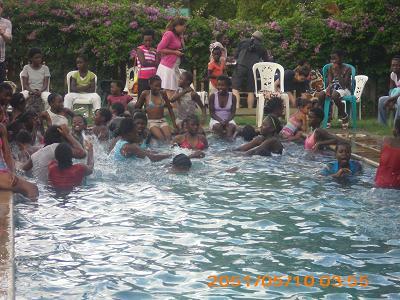 There was also time for swimming, as there was a swimming pool.Most Zambian school girls cannot swim as they don’t have access to swimming pools where they can learn. 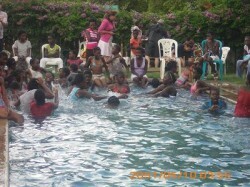 But they jumped in even though they could not swim they played around the shallow part of the pool. Staff member Biemba was the hero of the day as he pulled out a girl from the water very fast as she went on deep water, inexperienced as she was with swimming pools. While they were waiting for the paintings to dry, music was played and the girls danced their day away. Time was running out and the team had to leave. The girls bid farewell and continued dancing. They could not believe that they were given such VIP treatment without considering where they are coming from.